Every month, I look forward to sharing my blog income report with you guys, and this past month was no different. September was a good month! September was another really great month for me! I spent a lot of time working on sponsored posts, and I did my first bit of work for Pollinate Media which is a blogger media group that I’d been dying to get accepted into for months now. Other than that, there wasn’t anything totally new that I tried. And actually, it was extremely difficult for me this month because I was trying to juggle writing for my blog and writing my book. If you haven’t heard yet, yes, I’m writing a book. You can read a little more about it here. Just so you know, I’m holding a contest that could win you a shout out in my book, so check out my book update post to learn how to enter. I’m still accepting submissions. And while I’m super excited about it, I’m a little behind on my deadlines, so I need to spend most of October focusing on that, not on sponsored blog writing. Joe actually told me that I’m not allowed to take on new sponsored blog writing until after the wedding, because I’ve been a giant stress-ball trying to juggle a full time job, blogging, writing my book, our moving into our new house at the end of the month, and last minute wedding stuff for our November 7th wedding. LOL how on earth could I be stressed?? So yea, I have a bit of sponsored work left to finish up for October, but I know that October and November won’t be as successful monetarily for me as the past few months have. Right now I’ve got OTHER super important stuff going on that needs my attention. Once we get back from our honeymoon, I can get back to it. I can also spend more time focusing on my Etsy print shop, since I’m having so much fun with that. I’ll also be looking at ways to better automate my social media so I can spend less time promoting my work manually on Pinterest, and more time writing content. So that’s it! 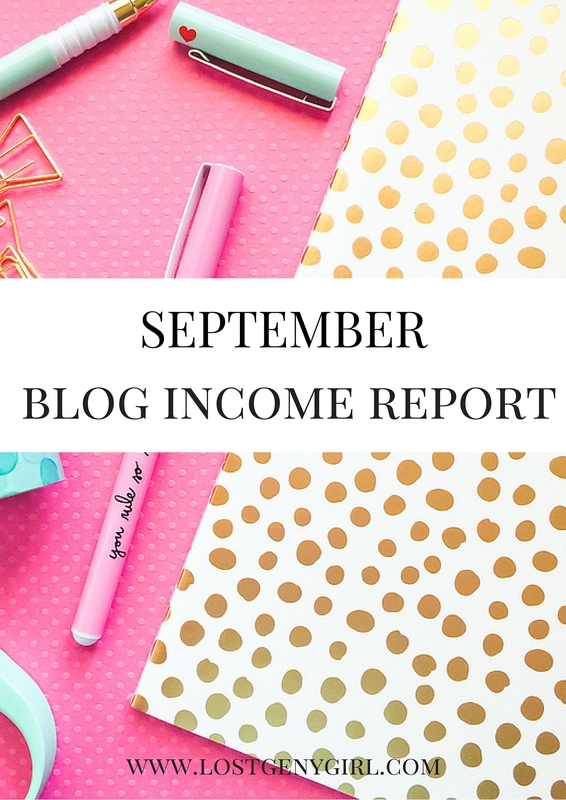 My September Blog Income Report! Hope you guys had a great month too! Now it’s your turn to share! What have you guys been doing to help monetize your blog?? Let’s help each other out in the comments!! I’m also offering one-on-one blog coaching calls, in case you’re interested. $25 for one-hour sessions where you can ask me all you want, and I can help you take your blog to the next level. Contact me here, and we’ll figure out the details. So Inspiring! I’ve been blogging for about 3 months now and I’m excited to get to this point! Thanks for posting. That is a lot of things to juggle! Good luck finishing up everything for the wedding – so exciting how quickly that is coming! And congrats on the income last month 🙂 Still very inspired! Congrats girl! You’re growing every month! So inspiring! thanks for sharing. So encouraging to see numbers and see how others set up a system to run their businesses. Looks like it was a great month for you! I can’t wait until I’m to a similar point. There’s currently no need for me to make an income report lol. I’m working hard to change that though. Good luck with your wedding! Awesome month! I just signed up for Amazon and am hoping that pans out well. I need to follow your lead and do more to earn more! Thanks for sharing! Wow, you are a superwoman! I can’t imagine juggling a full-time job, blogging, and writing a book. Throwing a wedding on top of that would push me over the edge. I think your husband is right, maybe put one of those things on the shelf or even partially on until after the wedding 😉 Thanks for sharing your income report, I can’t wait until my blog starts making anything! Seems like you are growing at a really good rate! It’s always fun to get to work with a new group! I am loving your income reports. I love being able to read it and see how you monetize things so I can see if they are steps I am interested in for the future. Good luck with your book writing and juggling!! Wow, you are doing so well! I get no love on my Amazon Associates links… I don’t know why but I never make that threshold. So much useful information here! 😀 Thank you for sharing! Great job. You are doing well! Thanks for posting these! They’re so inspirational! I have been learning from YOU!! The only other little Gem I found is Comission Factory. There appears to be a lot in there for Australian & New Zealand Brands (I’m from Australia) but they also have some global accounts and are growing bigger every day. Wow, you just kept me motivated!! I have a few things lined up. Hoping it will get me more exposures! So Inspiring! Been blogging only for about 6 months now and I’m excited to get to this point! Hoping I do too!! Thanks for posting. Thanks SO much for this post. I have dabbled with monetizing here and there, but it is so helpful to see how others go about it…I am getting more serious about my blog (I have blogged almost 7 years “for fun”, but being more business like now and hoping for a source of income) was so confused on where to focus – SEO, sponsored, affiliate, etc, and to know that others are diversifying is super helpful! so awesome; i love reading these posts. Quick question: do you tally in (for these posts) the money you’re expecting to receive, or the money that actually comes in that month? WOW! This is awesome! I would love to start making a little bit of money through what I love most! Thanks for sharing! It’s super helpful! How do you count your income? Do you get paid for each sponsored post? Or is it the product value that you include as income? Victoria I am so with you!! I feel like I am doing everything I can to get to that point. In the last few days I have tripled my subscribers by offering a free printable calendar which has been so exciting. I am so busy working on other resources so I can continue to engage my new readers and hopefully drive some more. Would love to know If you discover any tips as well 🙂 Happy to connect/ see your comment here. Can so relate!! Great post! I love reading income reports. They’re so insanely helpful. Those are my favorite posts to read from you! I started blogging two months ago and I decided to share my stats and income every month too. I think it will be nice for me to look back on these posts! Wow girl, you are doing it! Get it! This gives me a bunch of motivation! Truly inspiring to see someone doing this from scratch. Keep it up! Wow! You have done a tremendous job the last few months! I found your June income report and just spent the last twenty minutes pouring over all of them. You are quite inspiring. I seem to be stuck at about 6000 unique visitors per month for the last few months and you have provided some fantastic resources. Thanks! Subscribing and following you all over the place!